There’s a really great interview with mystery writer, Thomas H. Cook, in the September ’09 issue of January Magazine. In the article Ali Karim asks the very question that puzzles me every time I finish one of Cook’s novels. Why is this man not enormously famous? 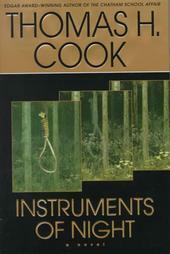 I mean, perhaps he is famous in mystery circles – but even if you’re not a fan of the genre, I think you should still give Cook a go. I picked up Instruments of Night on Friday night and read about 30 pages. It was late when I started and so eventually my eyes gave out. On Saturday I picked it up again and didn’t put it down until I finished – with a gasp, I must add – the book. I stumbled on Cook totally by accident three or four years back. I picked up, at a second hand bookstore, his novel Breakheart Hill and read these lines: “This is the darkest story I ever heard and all my life I have labored not to tell it.” Hooked. But that’s not all. Paul Graves is a tortured man. His own past is filled with ghosts, horrible ghosts. He is a beautifully nuanced character and I particularly admired the glimpse we got into his head as a writer. Perhaps Cook was revealing a little bit about himself there, I don’t know, but Paul’s imagination allowed him to write scenes, and adjust them as needed, on the fly. Using this technique, he attempts to solve the question of who killed Faye. The way Cook juggled the three threads of this story: the mystery of Faye’s death, the stand-off between Kessler and Slovak and the past that is creeping up on Paul is nothing short of amazing. But Cook is an accomplished writer. And this is literature. Truly. Page-turning, white-knuckling, horrifying literature. In every book I’ve read by him, I’ve been amazed at how complex his characters are and Paul is no exception. If you haven’t read Cook yet, I beg you to give him a go. He’s fabulous! This entry was posted in Uncategorized and tagged 2010, Book Review, favourite authors, highly recommended, literary fiction, mystery, psychological suspense by Christie. Bookmark the permalink.